I was able to complete this stitch sampler today. 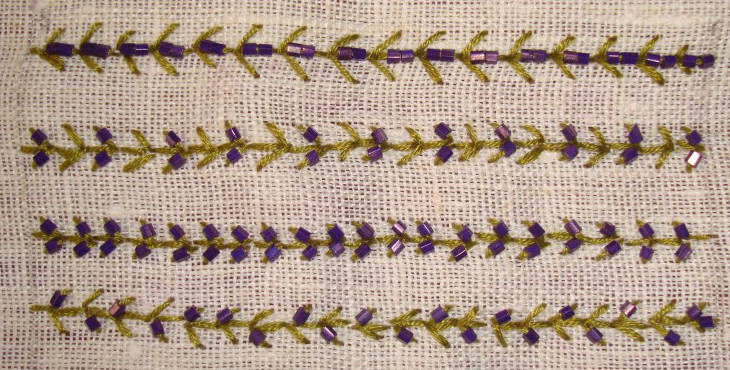 the working of this beaded fern stitch is on SharonB’s Pintangle. The completed sampler. I wanted to combine some other stitches with this stitch to build seams. But first started with the variations of the beading treatments of this stitch. 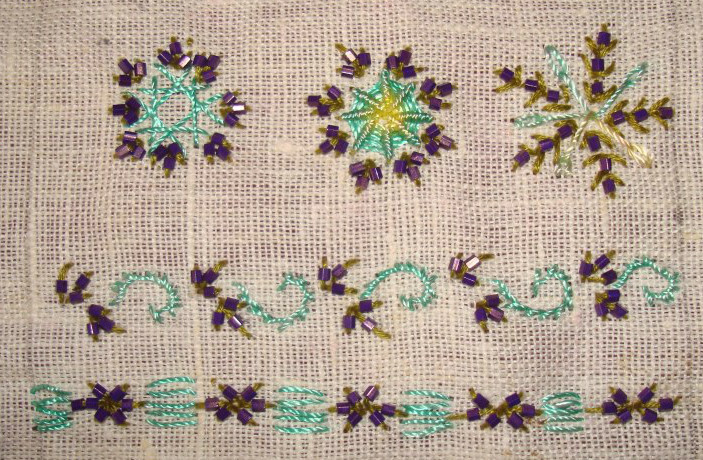 To work the stitch combinations, other stitches were first worked on the sampler. The first row, is with herringbone combination, the second row with up and down buttonhole stitch, the third row with half buttonhole wheels and the fourth row with feather stitch. First tried some motifs with, square herringbones, whipped wheel and long tailed chain stitch and then moved on to work rows with stem stitch curls, and running stitch. 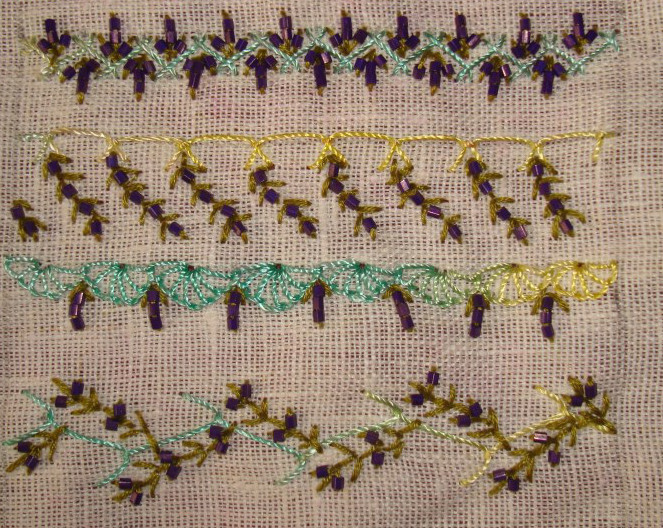 Beaded fern stitch with other stitches-laced straight stitches, chain stitch curls and linked chain and back stitch outline the beaded fern stitch in the last row. I enjoyed working on this stitch sampler. Other stitches are worked in polyester thread. 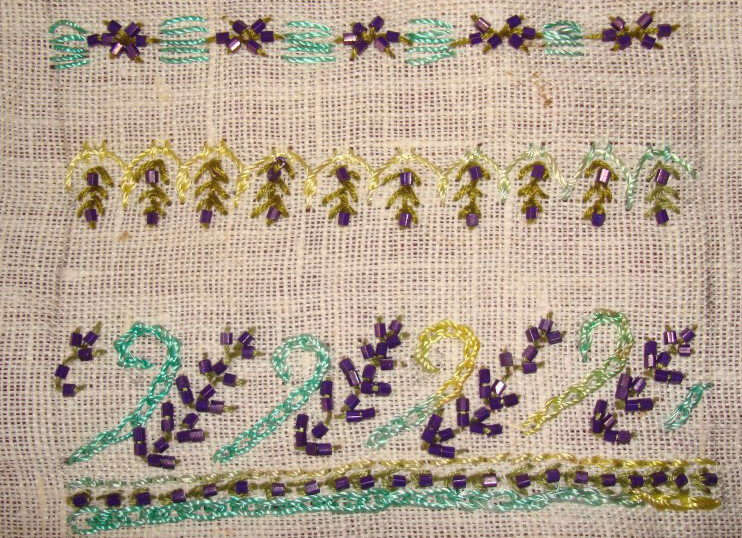 The beaded fern stitches were worked in green cotton skein. The beads I have are too small for the tapestry# 26 to pass through. For now, I am using beading needle to work stitches with beads.